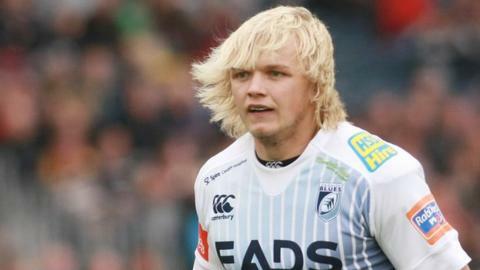 Cardiff Blues flanker Luke Hamilton has signed a two-year deal with Agen who could return to the French top flight next season. Former Wales Under-20 cap Hamilton, 22, has made 36 appearances for the Welsh region. On Twitter Hamilton expressed his delight at the two-season deal. The ex-Glamorgan Wanderers player also thanked the Blues and their fans for "their support over the last four years". He is the second Blues player to commit to a future in France in recent weeks. Wales wing Chris Czekaj will play for second-tier club Colomiers, but Agen are contenders for promotion as they lie third going into the final weeks of the season. Hamilton was the starting choice at blindside during Wales' five-match campaign at the 2012 Junior World Cup. He made his Blues debut at flanker during the 2010-11 season against Exeter Chiefs in the LV=Cup campaign and has made 10 appearances this season.